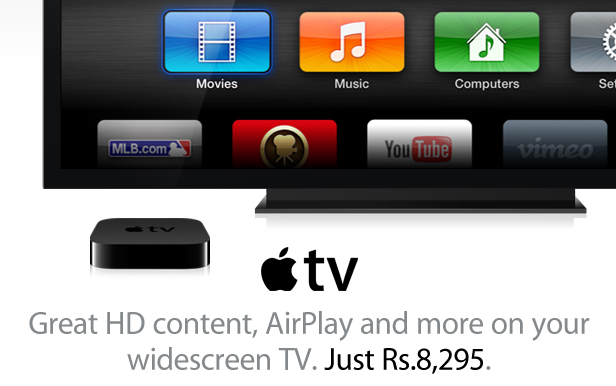 After officially bringing iTunes music and movies to India alongside a huge international rollout in December, Apple appears to have now launched Apple TV in the country. The Apple TV product page on Apple’s India website was first spotted by BGR India, but Apple has yet to issue an official press release announcing the product launch. The product page doesn’t include a “buy” button, and some reports claim stock has not yet made it to Apple resellers in the country. BGR first posted a screenshot of Apple’s site showing an Rs 7,900 price tag, but Apple’s website now shows a price of Rs 8295 (as pictured to the right). That’s roughly $150 USD and slightly higher than first rumored. As pictured above, the product page also highlights a number of Bollywood films and other local content in addition to The Wall Street Journal, YouTube, Vimeo, and MLB.TV.